Clean Air in London (CAL) has published a new report ‘Reducing exhaust emissions of nitrogen oxides (and particles) from diesel vehicles’. CAL’s investigation has found that successive Governments have ignored the warning signs as carcinogenic diesel emissions have become the largest and most urgent air pollution problem in cities. Perhaps as seriously, the current Government is failing to stop the removal of emissions control equipment designed to protect the public from those emissions and may be actively ‘covering-up’ a much bigger problem. At the heart of this problem are two pollutants: dangerous airborne particles (PM2.5 and PM10) and nitrogen dioxide (NO2). Legal limits for PM10 and nitrogen dioxide (NO2), a toxic gas, have been in legislation since 1999 to be complied with by January 2005 and 2010 respectively. 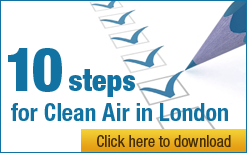 The Government says it complied finally with PM10 limit values in London in 2011. The Government has admitted that the UK will not comply with NO2 limit values in 15 of 43 zones until 2020 and in London until 2025. The Government downplays the health impacts of NO2, failing to mention that it is the only ‘modern’ molecule within the whole gaseous component of air pollution subject to World Health Organisation guidelines and legal limits. Whereas the particle component of air pollution is regulated by its total mass concentration, gases other than NO2 are largely ignored. It is vital therefore that levels of NO2 are reduced to avoid: its direct health effects and those of other toxic pollutants from combustion; and its contribution with nitrogen monoxide as a precursor to the formation of deadly particles. Sulphur dioxide, which is also regulated, has been largely eliminated as a problem by the use of ultra low sulphur fuels. NO2 limit values align with World Health Organisation guidelines whereas PM10 limit values are roughly double these guidelines. Policy Exchange has estimated that diesel vehicles are responsible for 91% of PM2.5 and 95% of NO2 exhaust emissions from road transport in London. Air pollution is also an equality issue. Policy Exchange found, in its report titled ‘Something in the Air: The forgotten crisis of Britain’s poor air quality’ at in the worst 10% of London for NO2, 5-10 year old children are 47% more likely than the London average to be eligible for free school meals and residents are 26% more likely than the London average to be on income support. Levels of NO2 in London are the highest of any capital city in Europe. But this is not just a London problem. The UK has the highest proportions of zones exceeding the NO2 annual limit value plus margin of tolerance of any country in Europe. The Government has sought to blame European engine emission standards for diesel vehicles for its failure to comply with NO2 limit values on the grounds that real world exhaust emissions of oxides of nitrogen (NOx) from diesel vehicles have been higher than originally expected. The same Minister ‘boasted’ on 23 December 2012 that he had championed the removal of these requirements for caravans and other vehicles. The Vehicle & Operator Services Agency is alleged to have admitted Note 6 “[Further,] it was therefore considered that the introduction of a Reason for Rejection for a missing diesel catalyst or filter at this stage, whilst complying with the Directive, was likely to lead to many incorrect failures, which is clearly unacceptable”. CAL has lodged an official complaint with the European Commission over the UK’s failure to implement Directive 2010/48/EU which specifies roadworthiness tests for motor vehicles and their trailers. “Nitrogen dioxide (NO2) laws are the most powerful tool citizens have to hammer down carcinogenic diesel exhaust and other toxic pollutants from combustion. “The Government and the Mayor of London are trying to blame European engine emissions standards for diesel vehicles for their failure to comply with legal limits for NO2. primary emissions of NO2 for passenger cars would be less than half today if the market share of diesel vehicles had remained where it was when NO2 limit values were set i.e. making it much easier to have complied with those limit values. “The facts show that successive Governments are largely to blame for encouraging diesel vehicles and failing to comply with NO2 limit values. robust enforcement of Directive 2010/48/EU which specifies roadworthiness tests for motor vehicles and their trailers, with immediate changes to the MOT. Vehicles should be declared unroadworthy and/or lose their insurance if engine or emission control equipment fitted by the manufacturer is absent, modified or obviously defective. “CAL wants a public statement from Ministers confirming that a motor vehicle and/or trailer is not roadworthy if the engine or exhaust emission control equipment fitted by the manufacturer is absent, modified or obviously defective. “Successive Governments failed to agree ‘technology neutral’ standards for emissions, failed to act when the failings of diesel vehicles were identified and are deliberately allowing the vehicle testing regime to permit the continued use of diesel vehicles that have had their engine or emission control equipment removed.